Marty Irons is managing pharmacist at Beauchamp and O'Rourke Pharmacy in Rutland. Irons helped launch a unique pilot program with Rutland Regional Medical Center to help protect the most vulnerable patients from medication errors. Despite the introduction of electronic medical records, pharmacists say they are often out of the loop when it comes to knowing if their patients' medications have been changed. Partly that’s a technology glitch. But many pharmacists complain that despite their expertise they’re not considered providers so most hospitals don’t allow them access to patients' electronic records. But at Beauchamp and O’Rourke, a family owned pharmacy in Rutland, managing pharmacist Marty Irons wants to change that. Standing behind the counter, he picks up picks up a personalized packet of medications that he put together for one of his customers. Irons says he routinely helps people who are on 15 to 20 medications a day. For those complex patients and those memory problems, Irons says they can pre-package 30-day supplies of medicines, organized and sealed into separate daily doses. They’re super user-friendly, he says and about 160 of their customers use them. Across town at Wilcox Pharmacy, Randy Pratico says they provide a similar service for between 500 and 600 people. 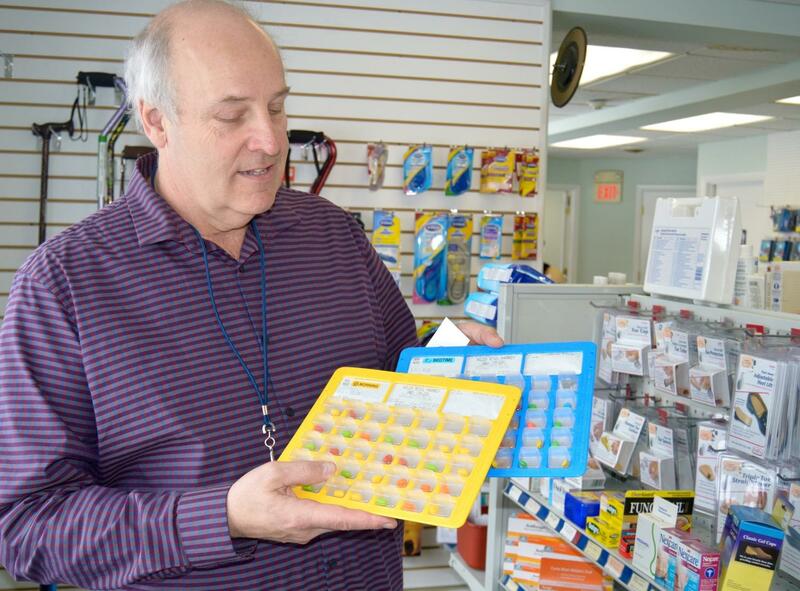 Randy Pratico, a long time pharmacist at Wilcox Pharmacy in Rutland holds up special medication packs they can make for especially complicated patients or those with memory problems. He says while convenient the packaging does have some drawbacks. While this type of packaging has become increasingly popular Pratico says there is a downside. “Where the problem is, a patient goes into the hospital, the hospitalist changes their meds or adds a med or takes a med away,” and Pratico says the pharmacist isn’t always kept in the loop. Kathy Boyd nods her head and says this type of thing occurs more than it should. Boyd directs Discharge Planning at Rutland Regional Medical Center and tells about a recent incident. But the pharmacy wasn’t aware of the change and when the woman returned home she went back to taking the pill packs that included Digoxin. That made the woman sick and Boyd says she had to be readmitted. “That’s just one incident,” said Boyd in frustration. Marty Irons says since the new pilot effort with Rutland Regional Medical Center began a few months ago, the number of his patients who have been hospitalized has dropped. Nationwide, scenarios like that cause thousand of deaths a year and ring up billions of dollars in medical bills. 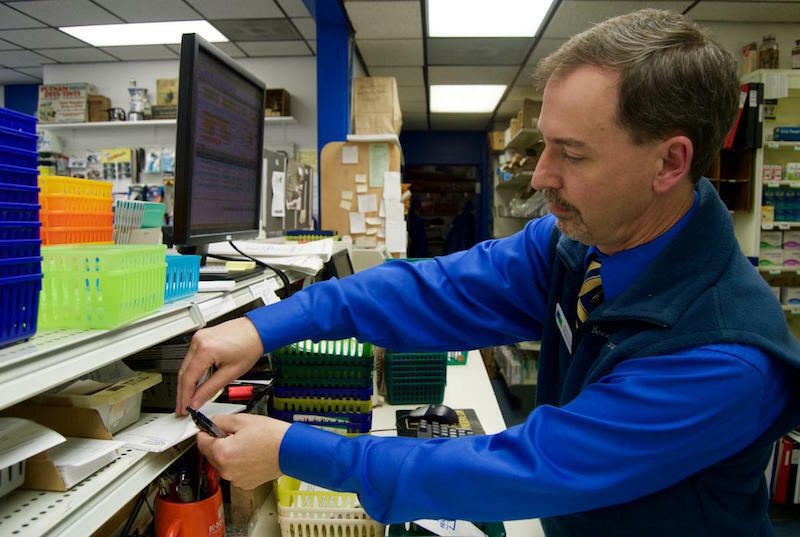 For pharmacists like Marty Irons, they mean countless hours on the phone sorting things out. “Finally, I just spoke to discharge planners at the hospital, the director of discharge planning, and just asked the question can I be credentialed to go into the computers? I’m a health professional and I’ve practiced in the community,” said Irons. Kathy Boyd was new to her management position at the hospital and admits she was surprised Irons didn’t already have access to their electronic medical records. But after sitting down with Irons and the hospital’s pharmacy director, she says it became clear they could do a better job sharing information. “We built a report, through our IT department here so Marty gets a report every day of which patients of his have been admitted to the hospital," Boyd said. And Boyd says Irons can now access hospital data. “So he can go in every day and say ‘OK, the patient was on 20 milligrams of Furosemide yesterday. Today it looks like the patient’s dose is going to increase to 40. I need to be aware of that because they only have 20 milligrams in their blister packs at home,’” Boyd explained. "So Marty is constantly monitoring his patients while they’re in the hospital,” adds Boyd, smiling. Access like this is unusual, according to the National Community Pharmacists Association. But it’s growing, says Shelly Spiro, executive director of the Pharmacy Health Information Technology Collaborative, a group that pushes for more pharmacist involvement in patient care. Spiro says hospitals are realizing that including pharmacists as part of a provider team can help reduce costly readmissions. Dr. Mark Stickney, a longtime primary care doctor in Rutland, agrees. “I think it’s very, very important to have give-and-take with pharmacies, with the pharmacists, with our health care providers and the hospital," Stickney said. He says with so many moving parts it takes a village to care for patients and keep the most vulnerable out of the hospital. Marty Irons says the new approach is working: “It’s a game-changer." As evidence, he points to the number of his patients who have had to be hospitalized since this pilot effort started. “January we averaged about six patients a day; February went down to five. March went down to two patients per day.” And Irons points out, “This is a 120-bed hospital that’s pretty much been full for three months." "It’s not something you can publish as a scientific paper, but it’s a great trend and we’re going to see where it goes,” he adds. The hospital is pleased as well. They’re expanding access to other local pharmacists who offer personalized blister-packed medications, like Randy Pratico. This idea may spread well beyond Rutland. Marty Iron’s efforts will be highlighted in an upcoming publication of the American Pharmacists Association. This story is the second in a two-part series. Find the first part here. Nearly 60 percent of Americans are taking prescription drugs – the highest percentage ever – and more than half of those 65 and older are taking five to nine medications. With all those pills in our medicine cabinets, it's no surprise that medication mix-ups are on the rise. Vermont Commissioner of Health Harry Chen is urging federal officials to alter medical guidelines that might be contributing to the state’s opiate abuse problem. New England lawmakers are urging the Environmental Protection Agency to issue an updated health advisory level for the chemical PFOA. On Monday night, Burlington’s City Council approved the creation of an Opiate Policy Manager to coordinate the city’s approach to the opiate crisis.